Miranda collaborated with the likes of Gloria Estefan and Jennifer Lopez. On Sept. 30 the president tweeted from his golf club in Bedminster, New Jersey, that Puerto Ricans "want everything to be done for them." "The Mayor of San Juan, who was very complimentary only a few days ago, has now been told by the Democrats that you must be nasty to Trump," Trump said in a series of tweets. "Such poor leadership ability by the Mayor of San Juan, and others in Puerto Rico, who are not able to get their workers to help. They want everything to be done for them when it should be a community effort." The majority of the island's residents were without food and water after Hurricane Maria. Miranda, 37, whose family is from Puerto Rico, said he did not watch coverage of Trump's visit to the island this week. "I waited to hear, 'Are we increasing aid? Are we increasing troops?'" Miranda said. "Short of that, I don’t need to see another photo op. I need action and I need people to help my island." Two weeks after Hurricane Maria made landfall in Puerto Rico, only 5.4 percent of citizens on the island have electricity, while 12.1 percent have cell service, the Department of Defense said on Wednesday. 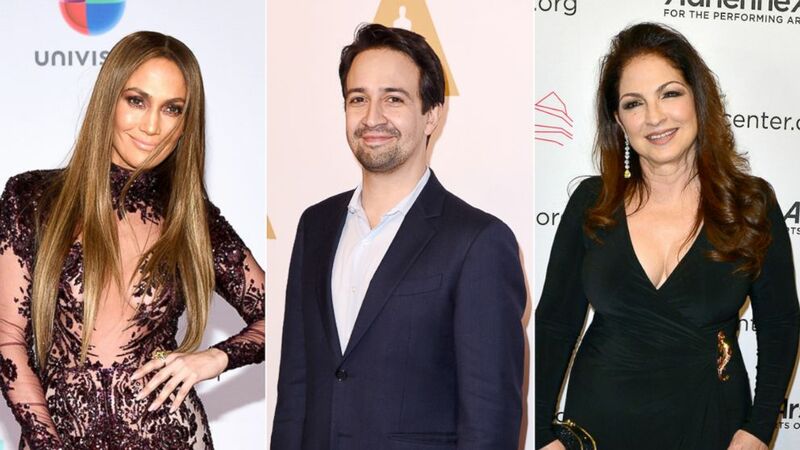 Miranda has turned his anger into action by partnering with an all-star roster of musicians, including Jennifer Lopez, Gloria Estefan and Marc Anthony, to release a song to benefit the people of Puerto Rico. (Getty Images) Jennifer Lopez attends The 17th Annual Latin Grammy Awards at T-Mobile Arena, Nov. 17, 2016, in Las Vegas | Composer Lin-Manuel Miranda attends the 89th Annual Academy Awards Nominee Luncheon at The Beverly Hilton Hotel, Feb. 6, 2017, in Beverly Hills, Calif. | Singer Gloria Estefan attends the 11th Season Gala Concert:A Celebration of Women in the Arts at The Adrienne Arsht Center for the Performing Arts at Knight Concert Hall, on March 30, 2017, in Miami. The title for the song, "Almost Like Praying," came from Miranda's belief that just sending "thoughts and prayers" to the people of Puerto Rico is not enough. "We need more. We need action," Miranda said. "We need the government response to be equal to the response of the people." He added, "I have never had more hope in the American people and people all over the world. If our government can step up to where the people we’ll be on the road to recovery a lot faster." The song is inspired by "Maria" from the musical "West Side Story." "I knew that name would forever have a different connotation on the island, and yet, I have a musical theater brain," Miranda said. "That’s where my head goes when I hear the name Maria ... The goal with this was to flip the meaning of the song to be about Puerto Rico." The song's lyrics list all of the 78 towns of Puerto Rico. "I said, ‘If we can get all 78 towns in the lyric for the song, the names will never be forgotten again,'" Miranda explained. "That was the impetus for writing the song." Miranda described the breakneck pace at which he wrote, recorded and released the song in less than two weeks. "Every artist made miracles happen," he said of song's contributors, who also include Camila Cabello, Gina Rodriguez, Anthony Ramos, Fat Joe, Luis Fonsi, John Leguizamo and Rita Moreno, among others. In one instance, Miranda said he gave Gloria Estefan a memory stick to take to Puerto Rican rapper PJ Sin Suela when Suela did not have enough bandwidth in Puerto Rico to email his recording. "I’m [talking] with him while Gloria Estefan is recording ["Almost Like Praying"] and Gloria Estefan goes, ‘I’m flying to Puerto Rico for relief efforts tomorrow,'" Miranda recalled. "I go, ‘Can I get you a memory stick?’"
He continued, "Gloria Estefan flies to Puerto Rico. We don’t know if it’s going to happen and that night I get an email and it’s a picture of Gloria Estefan and Emilio Estefan holding a memory stick." Miranda described the efforts for the song as "moving mountains." He is inspired to keep working for people on the island still in need of help, such as his cousin, who recently waited 12 hours in line for gas only to be allowed to get enough gas for his drive home. "It’s dire," Miranda said. "We’re still in a humanitarian crisis and we need all the help we can get." All proceeds from "Almost Like Praying" will benefit the Hispanic Federation's UNIDOS Disaster Relief Fund for Puerto Rico.